The flipout camper is attached to a pickup truck. The roof of the camper flips over to become a tent on top of the pickup truck, with living space below. I found the A-frame camping trailer set up amazing. I had seen one at a campground in America before, but I had never seen one set up. 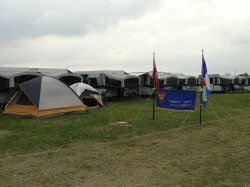 While it is all hard walls, it is shaped like an A frame tent, and although smaller than many pop up tent campers, it has some nice amenities. The tear drop campers are quite compact, although they do come in different sizes. Some are big enough to have a compact kitchen inside like and RV. While the little ones can be outfitted with a kitchen that is accessible from the outside. 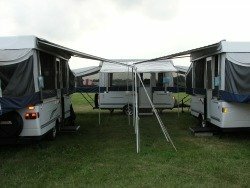 The living space for the small tear drop campers can be increased by attaching a canopy or screen tent to it. These are just a few comfortable ways to enjoy yourself camping.